An essential distinction is made between two fundamentally different contact situations in relation to the teeth. First, there are the approximal contacts of the teeth within the dentition, which happen in the contact points.The second type lies occlusally between the maxillary and mandibular dentitions when occluding. The approximal contact points lie deep in the interdental embrasure between the teeth. The overhanging approximal ridges of adjacent teeth form the interdental embrasure, a functional part of the masticatory area (Fig 5-47). As all the teeth taper down toward the root, the approximal contact points lie directly below the occlusal level. These contacts render the masticatory area closed, which has the function outlined above. The contact points are meant to protect the interdental papilla and therefore must be accurately reproduced. They should lie below the occlusal level but not too high in order to form an adequate interdental embrasure. They should not lie too low because, if they do, food can slip into the resulting recess or the interdental papilla can be squeezed. The same can happen if the contact point is too broad and flat. As a result of the natural movement of the teeth over time, the contact points are worn away, starting as punctiform, then eventually becoming linear and flat contacts. This gives rise to various contact situations and the teeth crowding together in a mesial direction. This process is also known as physiologic mesial migration of the teeth. 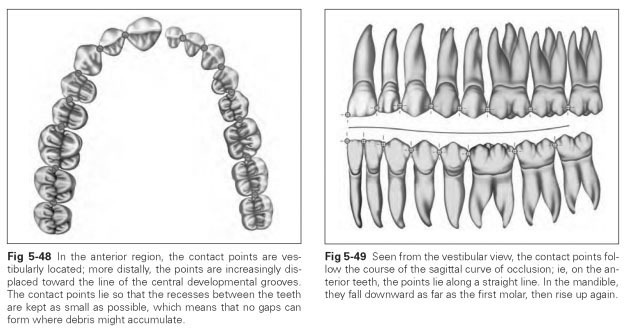 Seen occlusally, the contact points on the anterior teeth are located vestibularly, whereas the points on the posterior teeth are increasingly displaced toward the middle of the tooth until, in the case of the molars, they lie on the line of the central developmental grooves (Fig 5-48). This produces recesses between the teeth that can be kept clean by self-cleaning. Seen from the vestibular view, the position of the contact points, as they line up next to each other, follows the course of the sagittal curve of occlusion; ie, in the anterior region, the points lie along a straight line (Fig 5-49). In the mandible, they fall downward as far as the first molar, then rise up again; in the maxilla, the mesial contact point of the first molar is already higher again. Occlusal contacts are the tooth contacts of the opposing rows of teeth brought together in terminal occlusion. When masticatory surfaces are anatomically shaped and nonabraded, the occlusal contacts are punctiform. Flat occlusal contacts only develop as a result of abrasion. Centric stops denote the occlusal contacts on the occluding cusps in the case of occluding masticatory surfaces. Where there is anatomical "double interlocking," in which the supporting occluding cusps always lie between two cusps of the antagonists in the intercuspation position, just this cusp touches the opposing teeth centrically. Centric means the occlusal contacts meet the antagonists in the middle, so that the acting masticatory forces are passed on in the direction of the tooth axes and the periodontium is stressed in the center. Contact areas are the middle occlusal contacts into which the centric stops fit on the antagonist. This means that for each tooth there are both centric stops on the supporting occluding cusps as well as contact areas in the fossa area and on the approximal marginal ridges. Regular interlocking in the transverse direction is seen on the posterior teeth as a cusp-fossa relationship. 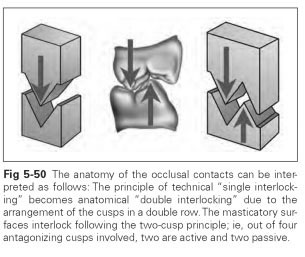 Based on the principle of technical "single interlocking," anatomical "double interlocking" of the teeth arises from the arrangement of the cusps in a double row (Fig 5-50). This means that the masticatory surfaces interlock according to the two-cusp principle; ie, the lingual cusps of the maxillary teeth interlock into the central fossa of the mandibular antagonists, while the buccal cusps of the maxillary teeth slide over the antagonists in a vestibular direction. For the buccal cusps of the mandibular teeth, this results in positioning in the central fossa of the maxillary antagonists; for the lingual cusps of the mandibular teeth, it results in overlapping over the lingual cusps of the maxillary teeth. The antagonist situation in the sagittal direction shows that the cusps of the posterior teeth always interlock into the interdental embrasures of the opposing teeth. As a result of the sloping surfaces of the cusps, the antagonists are driven apart as if by a wedge. In an interlocking relationship where the teeth are tipped in a sagittal direction, the masticatory pressure is not only absorbed axially by the teeth involved in the chewing act at the time but also passed on to the neighboring teeth via the approximal contact points.